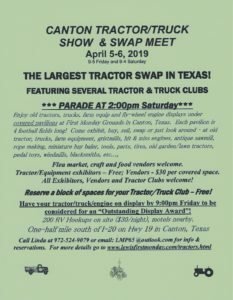 Tractor/Truck Show and Swap Meet at the First Monday Grounds in Canton Tx. Show under the covered pavilions. Featuring multiple area clubs. Space and RV rentals available. Search for a tractor repair shop or tractor club in your area. Features “Battle of the Brands.” The brand with the most tractors, lawn & garden tractors, etc. wins. We have demonstrations-events for the children-large craft & antique flea market-Parade of Power & much more!